Thanksgiving has long been portrayed as a meat-centerpiece holiday, with the main meal always being some turkey, chicken, or other poultry based mess. However, more plant-based and vegan-friendly replacements for Turkey have been brought into the mainstream as more people convert to these diets. 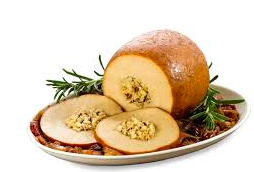 One such brand, Tofurky, has been making Thanksgiving dinners more bearable for proud vegans, such as myself. Tofurky creates and packages tofu-based bird substitutes, alongside gravies, stuffings, and desserts. However, this year I didn’t go for the packaged Tofurky, but rather made my own lentil “meat” loaf. Meals like this replace meat with a mix of tofu and lentil beans to create something decently resembling an actual, animal meatloaf. The recipe, which used peppers, carrots, onions, and lentils, turned out pretty well. Stuffing, another easy Thanksgiving meal, is easily recreated without meat. Usual stuffing recipes call for chicken stock or meat, but vegetable stock is an easy replacement to make healthier stuffing. Although Vegan Thanksgiving is different, it’s nowhere near bad. (Who wants to eat Turkey on any other day of the year anyway?) There is always a way to “veganize” a meal, especially on a holiday where everything can be customized, even though it is all based on the same, sub-par meat.